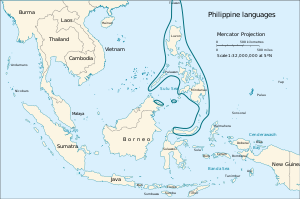 In linguistics, the Philippine languages are a proposal by Zorc (1986) and Robert Blust (1991, 2005) that all the languages of the Philippines and northern Sulawesi—except Sama–Bajaw (languages of the "Sea Gypsies") and a few languages of Palawan—form a subfamily of Austronesian languages. Although the Philippines is near the center of Austronesian expansion from Formosa, there is little linguistic diversity among the approximately 150 Philippine languages, suggesting that earlier diversity has been erased by the spread of the ancestor of the modern Philippine languages. The unclassified are considered by Reid (2013) to be early splits from Proto-Malayo-Polynesian. Lawrence Reid (1982, 2017, 2018) rejects the genetic unity of the Philippine languages, and considers the Philippine languages to form a linkage rather than a unified genetic subgroup. Reid (2018) lists the following branches and languages as separate Malayo-Polynesian branches. Reid (2013) accepts the following 14 branches as well-defined subgroups spoken within the geographical Philippines. The precise relationships of these subgroups with each other have not been completely resolved. Comparison chart between several selected Philippine languages spoken from north to south with Proto-Austronesian first for comparison. ^ Zorc, R.D. The genetic relationships of Philippine languages. 1986. In Geraghty, P., Carrington, L. and Wurm, S.A. editors, FOCAL II: Papers from the Fourth International Conference on Austronesian Linguistics. C-94:147-173. Pacific Linguistics, The Australian National University, 1986. ^ Blust, Robert (1991). "The Greater Central Philippines hypothesis". Oceanic Linguistics. 30 (2): 73–129. doi:10.2307/3623084. JSTOR 3623084. ^ Blust, Robert A. (2005). "The linguistic macrohistory of the Philippines". In Liao, Hsiu-Chuan; Rubino, Carl R.Galvez (eds.). Current issues in Philippine linguistics pangaral kay Lawrence A. Reid. 2005: Linguistic Society of the Philippines and SIL Philippines. pp. 31–68. ^ a b Reid, Lawrence A. (2013) "Who Are the Philippine Negritos? Evidence from Language." Human Biology: Vol. 85: Iss. 1, Article 15. ^ Reid, Lawrence. 1982. The demise of Proto-Philippines. In Papers from the Third International Conference on Austronesian Linguistics, Vol. 2: Tracking the travellers, ed. by Amran Halim, Lois Carrington, and Stephen Wurm, 201-216. Pacific Linguistics Series C, No. 75. Canberra: Australian National University. ^ Reid, Lawrence. 2017. Revisiting the position of Philippine languages in the Austronesian family. The Br. Andrew Gonzalez FSC (BAG) Distinguished Professorial Chair Lecture, 2017, De La Salle University, Manila. Reid, Lawrence A. (2013) "Who Are the Philippine Negritos? Evidence from Language." Human Biology: Vol. 85: Iss. 1, Article 15. Zorc, R. David. 1972. Field notes.